Six years after signing with the Phillies on his 16th birthday, Carlos Tocci continues to showcase a plus hit tool to go alongside sturdy defense in center field at Double-A Reading. TRENTON – The final week of the penultimate month of the greatest regular season in Phillies history was a busy one on the team’s transaction wire. On Aug. 22, 2011, Jimmy Rollins was placed on the disabled list. A day later, Cole Hamels joined Rollins on the DL. Infielder Pete Orr was on the turnpike twice, recalled and optioned from the IronPigs in the span of six days, Jose Contreras was transferred to the 60-day DL, Michael Schwimer was optioned to Lehigh Valley a day before rosters expanded, and the Phillies added John Bowker to the major league roster. There was one other significant transaction that week: the Phillies signed an international free agent on the day he turned 16-years old. Carlos Tocci, a lanky Venezuelan kid with a plus hit tool, celebrated his birthday by signing a professional contract to play baseball. 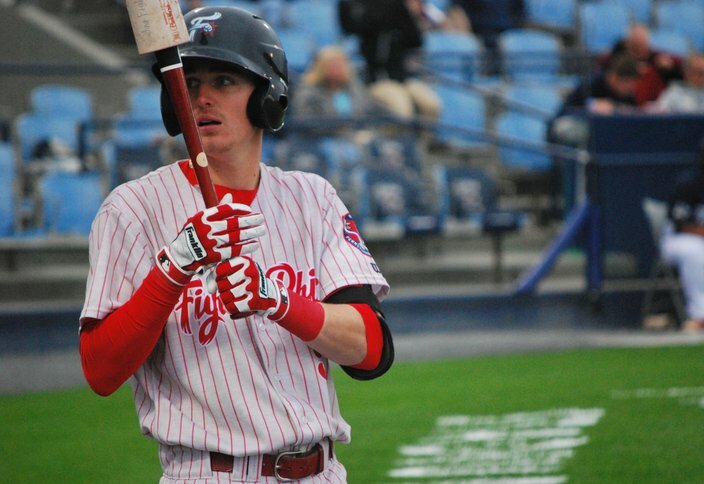 A half dozen years later, Tocci is mostly flying under the radar of the talented group of major league-ready outfielders in the upper levels of the Phillies farm system while patrolling center field and hitting third in Greg Legg’s lineup at Double-A Reading. Tocci, now five weeks away from his 22nd birthday, went 2-for-5 with two doubles, a sacrifice fly, and four RBI in Reading’s 11-4 win over New Hampshire on Monday night. He had followed up a four-hit game on Sunday with a four-RBI game on Monday. Tocci’s second double on Monday was his 100th hit of the season. Only one player in the Phillies system has more hits this year: Scott Kingery, with 107 between Reading and Triple-A Lehigh Valley. Tocci enters play on Tuesday night slashing .309/.369/.410 in 85 games in Reading. His OBP ranks 4th in the Eastern League among players with at least 300 at-bats. In the last three seasons, from Low-A Lakewood to High-A Clearwater to Reading, Tocci is slashing .291/.343/.374. No, Tocci isn’t known for his power. Yes, he is known as a right-handed hitting center fielder who tracks down everything in the outfield and consistently puts contact on the baseball in the batter’s box with a disciplined approach for a 21-year-old. “Best I’ve seen,” Double-A Reading hitting coach John Mizerock, who had the likes of Kingery and Andrew Pullin in his lineup for the season’s first 2 1/2 months, said two weeks ago. “Last night he was down 0-2 and next thing you know four pitches were close, but (it’s) ball four and he’s headed down to first. Tocci has been known for his advanced contact tool since he signed with the Phillies as a teenager. Along with his elite outfield defense, Tocci’s hitting ability allowed the development staff to be aggressive in sending him to Lakewood for his first full season of pro ball in 2013. Tocci played in the South Atlantic League that summer as a 17-year old – he was 16 months younger than Mickey Moniak is playing in that league this season. Tocci reached Clearwater before his 20th birthday was ticketed for Double-A following a productive 2016 campaign (.284, .331 OBP, 26 doubles, 13 stolen bases) as long as he cleared one somewhat uncertain hurdle. Tocci was left unprotected by the Phillies in the Rule 5 Draft. The Phils were likely banking on the unlikelihood that another major league team would promise a 25-man roster spot for a full season to a kid who had yet to advance beyond A-ball. Four years earlier, they had selected a similarly-skilled Venezuelan center fielder, Ender Inciarte, but quickly came to the conclusion (regrettably, in hindsight) that they could not trust an MLB roster spot to a player who had yet to play Double-A. Tocci, unlike Inciarte, went unselected in December’s Rule 5 Draft. But wouldn’t the intrigue of going to a big league camp and possibly making a major-league roster be pretty enticing? And the Phillies obviously feel good that a kid they zoned in on six years ago didn’t get away. “I know this – he keeps getting better every year,” said Reading manager Greg Legg, who managed Tocci at Lakewood four summers ago. “The thing with Tocci from an offensive standpoint is it’s almost every night you come to the ballpark and he barrels up two balls every night. They might not be hits but he barrels it, he has the ability to really square up a ball at least twice every night, sometimes three. Tocci, who hit just seven home runs in 1,009 at-bats in 2015 and 2016, homered on back-to-back nights earlier this month. But they’re also the only two he’s hit all season, to go along with 13 doubles, seven triples, and 111 singles in 324 at-bats. Carlos Tocci is hitting .349/.400/.505 with five doubles, three triples, two home runs in 28 games since June 15 at Double-A Reading. The hope from the Phillies’ brass, of course, is that the still rail-thin Tocci can develop into even just a little bit of power. No one is expecting a 20-30 home run player, but one that can hit 30-40 doubles with his other skill sets would play at the big league level. It’s easy to forget Tocci is still just 21 and developing into, as Legg called it, ‘man-strength.’ And it doesn’t take long to find others through the Phillies’ system that they’re waiting on for similar progress, too. Like top prospect J.P. Crawford, who is seven months older than Tocci. Crawford nearly has as many home runs in his last 13 games at Triple-A (six, in 47 at-bats) as he had in the entirety of the 2016 season (seven, in 472 at-bats in 123 games). 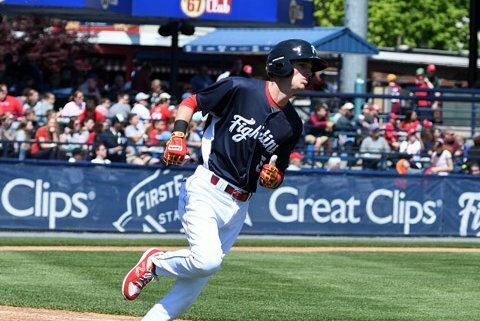 Others in the system that have developed into their power after their 22nd birthdays include Tocci’s Reading teammate and fellow Eastern League All-Star, third baseman Mitch Walding, and, of course, Kingery, the breakout second base prospect. No matter how you slice it up, Tocci’s production in the last month has been sublime: .349/.400/.505 with five doubles, three triples, two home runs in 28 games over 120 plate appearances, with 12 strikeouts and nine walks. “He’s a young man, I don’t think he’s got his man strength and I think time is going to tell us more,” Legg said. “Every year someone asks me, ‘Is he ever going to hit home runs?’ And I say, ‘Yeah, but's he’s hitting the ball eight feet further.’ Or six feet further. Each year he’s hitting the ball harder and further. It’s just been one of those things. He’s been a steady player.